« Red Pitaya SDR as Core of CW Skimmer Station Rebuild. Most of the 2015 W4O IOTA station from Okracoke Island. Tri band yagi at 18 feet. After a lot of foot dragging and interruptions, all of the components required for a 100w battery operation had been acquired at casa W4KAZ in late spring 2015. 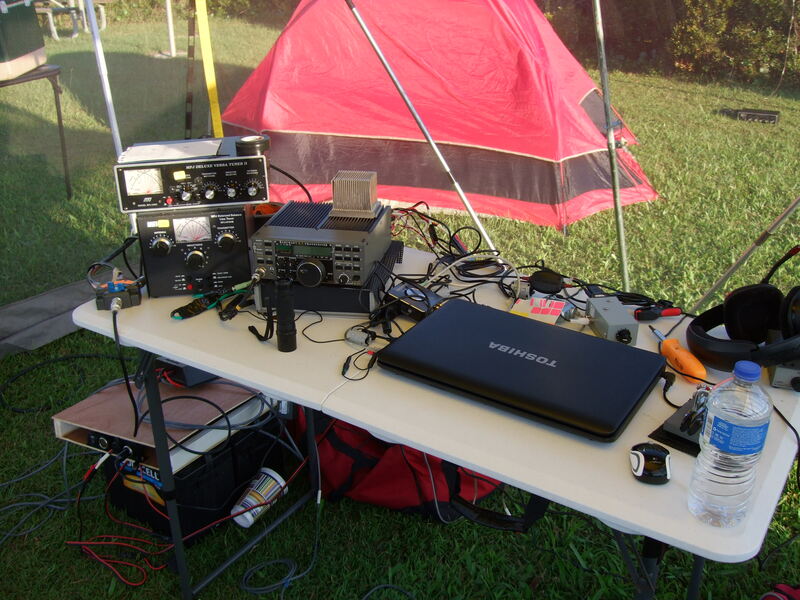 The first test run was a 1E Field day operation at home. But better to put it to use afield. So N4YDU was game for the field test on Okracoke island for 2015 IOTA. N4YDU and I operated as W4O from Okracoke Island on the NC outer banks, just south of Hatteras. Access to Okracoke is by boat, so we booked slots on the ferry out of Swan Quarter for Thursday afternoon. This worked well, allowing for set up and test operating well before the Saturday start. Also a nice break for a meal for lunch Friday down in Okracoke village. 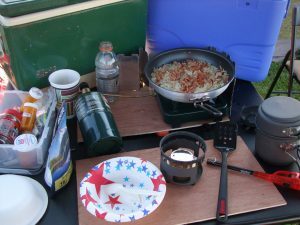 QTH of the operation was the NPS campground on Okracoke. WX Conditions on Thursday were cool with an all day drizzle. Ugly, but no thunder and lightening, so not terrible. Set up of camp was delayed until early evening. Thursday night was warm, damp and still. Friday morning brought clear skies and an nice cooling breeze out of the north. The WX was much improved for the rest of the weekend. Thursdays rain was the harbinger of a very welcome unseasonable cool front, and WX for the bulk of the weekend were very comfortable with much lower than normal temperature and humidity – perfect for field operations. Radio propagation did not live up to the WX, so there were periods of slow conditions. A nice breakfast is always good. 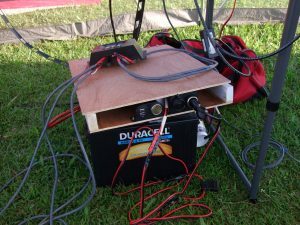 The solar set up included two 30w solar cells sending power to the charge controller and two deep cycle batteries. 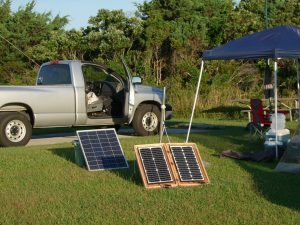 Our solar cells were augmented by the temporary loan of an 85w solar panel by WB8YJF, Jon. WB8YJF vacations at Okracoke every year at this time, and with his help we had a strong 8A charge current throughout the day Saturday. Solar cells out catching a tan on the island. My own small cells in the foreground and WB8YJF’s loaners in the rear. Having the battery fully charged going into the evening hours was nice. 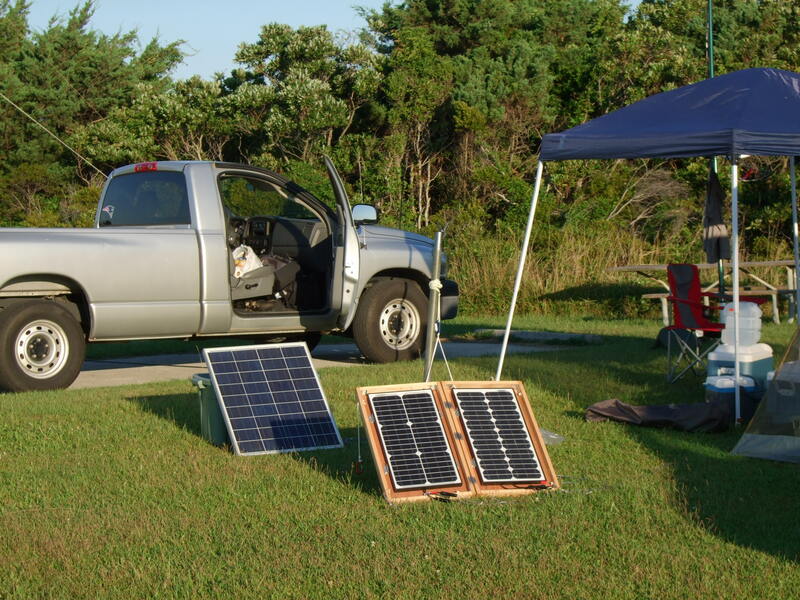 Rates slowed fairly early, so two days of beachside life had us leaving a few possible qso’s on the table. Sleep was the better option. 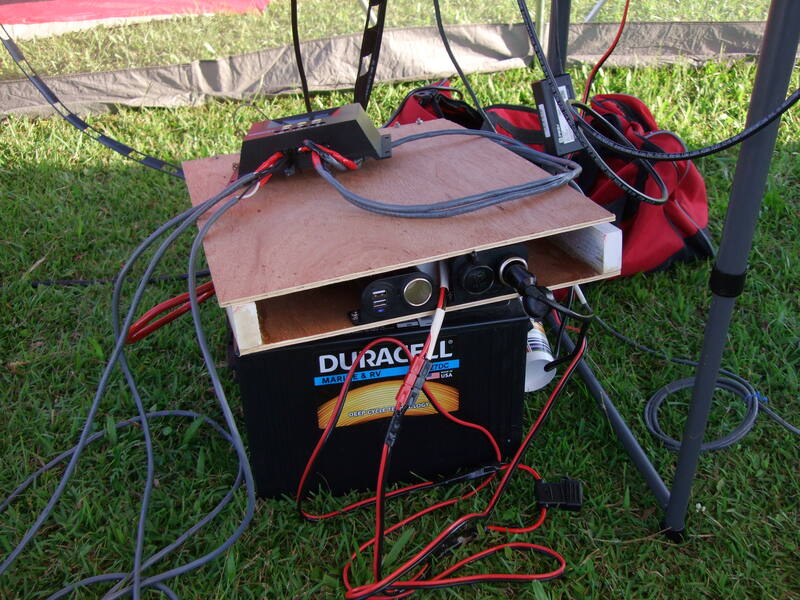 The station consisted of the batteries, feeding power to the Elecraft K2. Antenna supports consisted of several fiberglass masts. All of the masts have been modified by drilling holes at the base of each mast section for pins. Hitch pins are used for the smallest sections, and 2 inch cotter pins are used in the larger sections. This was faster and more secure than using hose clamps, but it may ultimately weaken the masts over the long term. That trade-off seems worthwhile for the time saved on deployment and take down. 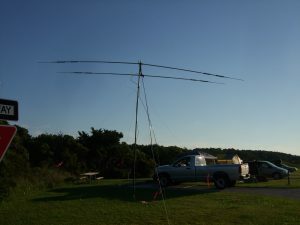 The 33 foot fiberglass pole from TheMastCo was used as the center support for a lightweight fan dipole for constructed from 300 ohm twin lead and surplus field wire, covering 40m/20m. A 22foot fiberglass flag pole combined with most of a 20 ft. Shakespeare wonder pole was used to support an inverted-L for 80m. 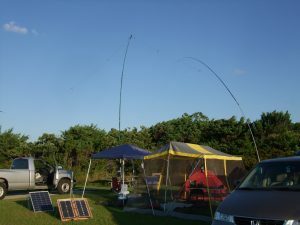 Thirteen foot crappie poles were used to get the ends of the dipoles and vertical as high as possible in the limited space offered by two spaces in the campground. We also deployed a 2 element triband yagi on five sections of surplus military camo mast, at a height of about 18 feet. Radio conditions were poor, but the WX was unusually good for the NC coast at the end of July. Great trip and another successful field test of something different.